Just a five minute walk from where their lives began nearly a century earlier, two Second World War veterans sat down for tea and a conversation led them down memory lane. The talk spanned decades and offered insight into how this country became what it is today—though they would never describe it as such. With pictures of their younger selves in hand, they touched on memories of their family farms backing on to what’s now known as Gordon Drive, long before streets cut up the orchards that were once there. They recalled a teacher at Okanagan Mission Elementary School who inspired them to challenge themselves and view the world in a different way. They offered anecdotes about taking their horses and buggies along the muddy stretch that was Bernard Avenue so they could enjoy “breaded veal cutlets and banana cream pie” and about the Mission being a WASPy place where croquet was played and the traditions from across the pond were upheld. And they reflected on how they, like many of their school friends and family whose names will be seen this weekend on cenotaphs around this city, joined the war effort when duty called. The stories of Joan Needham (nee Mallet-Paret) and Daphne Holden (nee Bell), 95, are like those many other women who enlisted in the war in that they are rarely touched on during Remembrance Day. As Daphne pointed out, they didn’t go into combat or line the trenches in Europe, though they were prepared to do as much. With an air punch and a giggle she said she received “commando training” just in case the Japanese invaded—a not totally unrealistic threat given the Japanese submarine in the waters off the Pacific Coast. Joan joined the Canadian Airforce when her twin brother enlisted. During her military career she was stationed in Ottawa, Kingston and Toronto. She taught airforce administration and, most memorably, worked deciphering Japanese Morse code. “There was boarding school there and children whose parents were fighting in the war had been sent there for safety—I did that for a year and decided I’d had enough of children, so I was going to join the airforce,” she said, remembering the frustration that she felt when her father insisted on joining her when she went to enlist in Vancouver. A good time was being had by all at the Fairmont Hotel Vancouver where new recruits were meeting, and she was with her chaperone. “I’d told him I’d already been on my own, but he insisted on coming,” she said. She was the fourth in her family to leave Kelowna for the war effort. Her eldest brother Jack had enlisted in the army and was stationed in Holland. Her brother Brian had been in the airforce. He was shot down in the Battle of Britain in August of 1940 and her older sister had travelled earlier to England to be a nurse. She ended up joining the Queen Alexander nursing service and stationed in India. Keith Boehmer, a military historian, with the Okanagan Military Museum said that women in all countries locked in the war contributed greatly to the cultural changes that we take for granted today. As was the case in the First World War, women stepped up in their communities to fill gaps left by men who went overseas to fight, and they kept local economies alive. The Second World War was different because women who wanted to play an active role in the war lobbied the government to form military organizations they could join. Veterans Affairs Canada said that in 1941 and ‘42, the military created its own women’s forces and more than 50,000 women donned a uniform for some branch of the armed forces. The Canadian Women’s Army Corps had 21,600 members. The Women’s Division, Royal Canadian Air Force had 17,400 members. The Women’s Royal Canadian Naval Service had 7,100 members. Women in the services were mechanics, parachute riggers, wireless operators, clerks and photographers. And like Joan and Daphne they helped the Allied forces win the war. That transition, said Boehmer, was significant in Canadian history. And that, he said, made way for the next cultural shift. 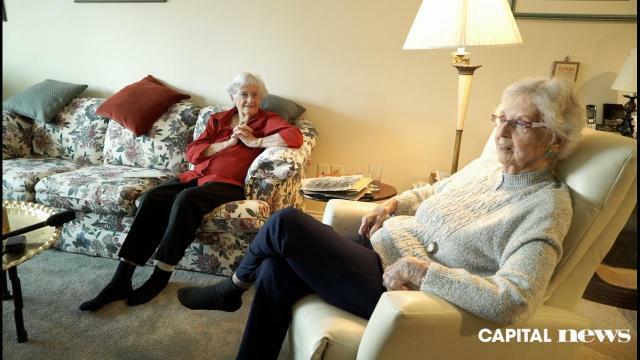 While some pushed against boundaries that had long been girded by tradition, Joan and Daphne both said that they were happy to give up wartime life and return to something more traditional. “We had what they call a good war,” said Joan, noting being so far from combat allowed them a safe space to explore their freedom. It was while she was alone and in Ottawa that she found the path home. Her mother told her that the son of a friend she had was ill, and asked her to visit. He turned out to be her future husband and they returned to Kelowna and built a life together. Daphne met an English man and she moved to England as a war-bride. They were there for a short while before returning back to Canada. She didn’t make it back to Kelowna for years. For years the two childhood friends didn’t make contact, but that eventually changed and they moved into the same retirement village. And this weekend, on Remembrance Day, they won’t be focused on the unique tales that brought them back to where their stories began. To them, this isn’t a moment to reflect on history. It’s a chance to remember those who went away shortly after their schoolyard days and never returned. “So many kids we knew from school never came back,” said Joan, listing names. Daphne nodded and added a few of her own. “I can think of 12 right now who didn’t come back and they all left in their teens and early 20s,” said Daphne, who said it was the death of her brother that was the “terrible loss” she’ll think about on Remembrance Day. Joan said she’ll remember her father, who served in the First World War.